During 2013, and for the first couple of months of this year I worked in Early Childhood, specifically as a reliever for Kidicorp. I haven't made that public knowledge before because I didn't want to reveal my workplace, but as I'm doing nail stuff now I might as well put it out there. Plus... these nails give it away, slightly! I did them on Jackie, a friend from one of the centres I spent a bit of time at. I loved the kids there so much. I still miss them heaps. My husband is working in ECE this year, relieving as well ( but through a different organisation) and I get so jealous when he comes home and tells me all the funny things the kids said that day! If nails don't work out, I know where I'll be headed. 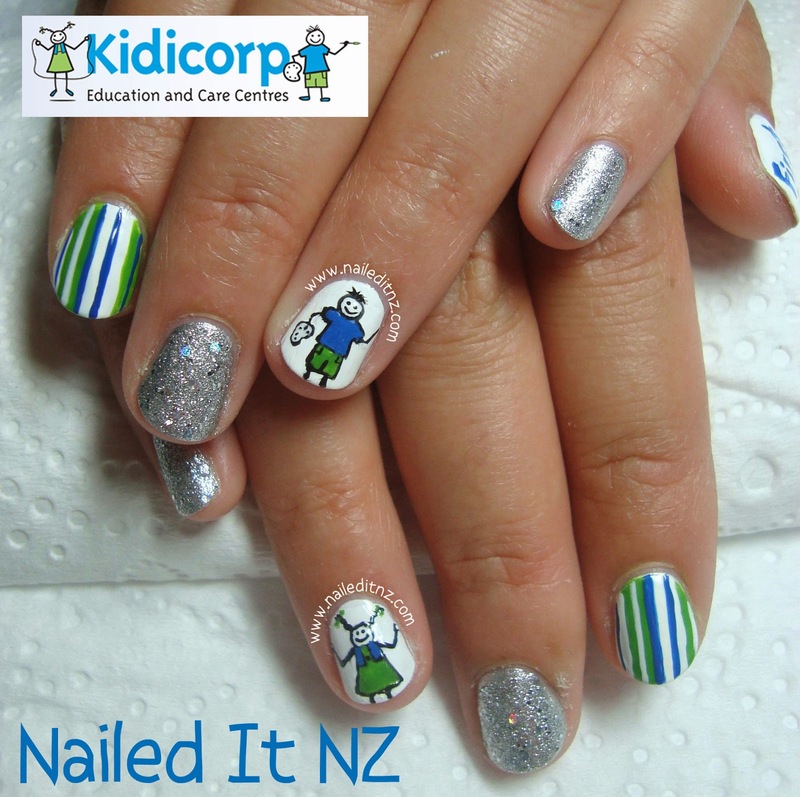 The Kidicorp logo is what these nails were based off - you can see it here. I was pretty happy with how they turned out! I'll probably send a few emails around the centres I worked at when I open my home salon, I know the teachers loved my nails and this is a pretty relevant selling point ☺. [Sigh]. I miss my babies. I wish it was socially acceptable to visit daycare centres without being related to the children! Anyway, hope everyone's having a good week. Got another tutorial coming this weekend on YouTube!